Israel’s illegal land grab in West Bank: The Israeli rationale is no different than Vladimir Putin’s in Ukraine. It’s using the same twisted arguments to rationalize its illegal land grab in the West Bank. 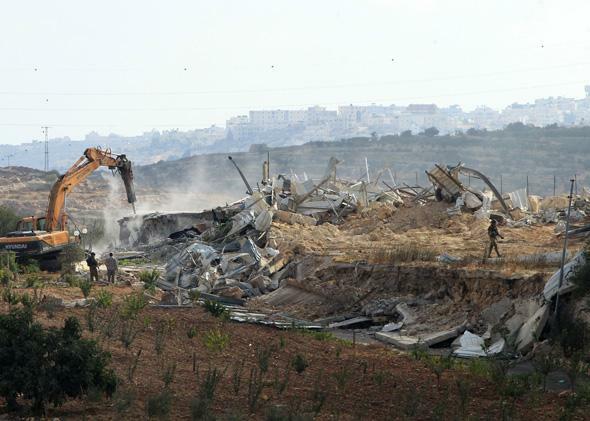 Israeli authorities use heavy machinery to demolish an Islamic Society dairy factory in the Israeli-occupied West Bank city of Hebron on Sept. 2, 2014. The United States has defended that principle in Ukraine and Iraq: You can’t use force to grab territory or change borders. But Israel, a U.S. ally, continues to violate the rule. This weekend, Israel claimed yet more Palestinian territory: nearly 1,000 acres, its biggest land grab in 30 years. The land isn’t in Gaza, where Hamas has been firing rockets and digging tunnels. It’s in the West Bank, where Palestinian President Mahmoud Abbas has been preaching nonviolence and trying to negotiate a peace agreement. Israel controls more than 40 percent of the West Bank, using its army to facilitate the occupation of this land by Jewish settlers. This is land never granted to Israel under any agreement. It’s theft. On Sunday, while the world was distracted by Putin and ISIS, Israel grabbed another chunk. Its army announced that 988 acres near Bethlehem—many of which, according to Palestinian officials, are planted with olive trees and belong to Palestinian families—are now Israeli land. This isn’t a Putin-style invasion or an ISIS-level bloodbath. But it’s offensive for many reasons. It’s a slap at the United States, which stood with Israel in its latest war in Gaza, and at European countries that cut Israel lots of slack during the lopsided conflict. It’s a thumb in the eye of Secretary of State John Kerry, who keeps trying to restart peace talks. And it discredits Abbas, sending every Palestinian a message that negotiation is for suckers. How do Israeli officials and settlers justify the confiscation? They say Palestinians aren’t using the land. They say individual Palestinians have no proof of ownership. They say Israel needs the land to house a growing population—an argument that might be called, in honor of Israel’s pro-settlement foreign minister, Liebermansraum. Israel also says the land claim makes no real difference, because these acres are part of the territory Israel plans to keep in any permanent deal with the Palestinians. If you’re going to take it eventually, it isn’t really theft. What’s more disturbing, from the standpoint of international norms, is the close resemblance between Israel’s and Russia’s rationalizations. Israelis point out that hundreds of thousands of Jews live in the West Bank and East Jerusalem. Russians make the same case for protecting ethnic Russians in Ukraine. Israelis say they need the new patch of land to connect their West Bank outposts to Israel proper. Russians use the same logic to justify carving a land bridge to Crimea. Israelis say they captured the West Bank fairly in a long-ago war started by the other side. Russia could say the same about its World War II reclamation of Ukraine. Israel says it’s still willing to negotiate peace; the ongoing settlements just add to its leverage. That’s exactly how Russian officials view their bullying in Ukraine. When Israeli leaders act and talk that way, is it any wonder that Palestinians begin to view settlers as military targets? Israel has made settlement an instrument of, and an advertisement for, collective punishment. It has blurred the distinction between civilian and military, between habitation and aggression. The settlers worry that the confiscation and construction might stop. They fear, in the words of the pro-settler news site Arutz Sheva, that a construction freeze will become the status quo, and any further settlement will be regarded as “a deviation from the norm.” In short, they fear that the principle we’re standing for in Ukraine and Iraq—that you can’t take land just because you have the power—will apply in Palestine, too. I hope they’re right.